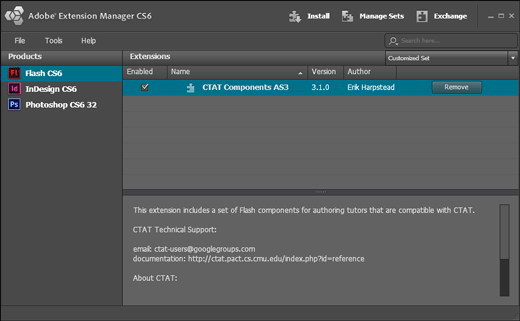 The Adobe Extension Manager is required to install the CTAT Flash components. If you don't see the Extension Manager in your list of installed programs, download and install it. In Windows, select Adobe Extension Manager from the Start menu. In Mac OS X, double-click the Extension Manager icon in the Applications/Adobe Extension Manager folder. In the Extension Manager under "Products", ensure the version of Flash you will use to author tutors is selected (e.g., Flash CS6). Which version should you use? The AS3 version has fewer components than the AS2 version, but it uses a more up-to-date scripting language and is more consistent between components. Support for the AS2 components will be discontinued at some point in the future as we focus our development efforts on AS3. You can compare the list of AS2 components and AS3 components. Note: You can install both versions of the components, but you can only use the ActionScript 3.0 version of the components in an AS 3.0 document, and the ActionScript 2.0 version of the components in an AS 2.0 document. These components should now be available from the Components panel in the Flash IDE after you create or open a Flash document.